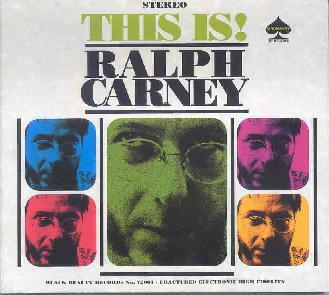 Ralph Carney - "This Is!" I didn't think I'd ever heard of Ralph Carney but then I read the bio and saw that he was a founding member of Tin Huey and the Swollen Monkeys. It also notes that he performed with the likes of William Burroughs, Allen Ginsberg, Marc Ribot, Bill Laswell, Pere Ubu's David Thomas, Daevid Allen, Mushroom, and others. On This Is!, Carney's third solo album, he explores a seriously twisted world that dissects bits and pieces of Dixieland and various other forms of jazz, traditional ethnic music of all stripes, rock and exotica, and skillfully stitches them together to create a strange and often riotous Frankenstein of musical styles. I had a blast listening to Carney's glom of traditional styles jammed through an avant-garde blender, coming out sounding like a whimsical and intricately structured New Orleans edition of the Bonzo Dog Band collaborating with Aksak Maboul. The CD opens innocently enough with "Jud Gland Music", a rousing Dixieland jazz number fit for Marde Gras. But things start to descend into the surreal with "Get Yur Bargain", a twisted melting pot of traditional musical styles that you might hear in old New York City neighborhoods. But there's a lot happening here in the course of this busy 5 minute track, with Carney injecting a variety of voice samples and fun chaotic sounds. "Pele Mele" is like a Hawaiian luau where everyone is dosed on acid. And the trip continues on "Cow Lap" as all the party folks begin their paisley rainbow colored hula dance. "Tis Sad" is something that I can only describe as kosmiche lounge music for the head, performed in a Jewish deli. Among my favorites though are "Marshall Allen Plan", a quirky acid rocking free-jazz piece that was way too short. "Heckraiser" is different from most of the album, being a dark, atmospheric journey with shades of the Residents. "Turkey Neck" gets even deeper in Residential freaky-land, though Carney is far more whimsical and instrumentally varied in his approach. "April 15, 2002" is similar but incorporates many of the stylistic influences heard across the album. It's a nearly 13 minute, fairly warped voyage that includes wailing horns, chamber orchestration, acid rock, eerie ambient waves and effects, Carl Stallings silliness, and cinematic intensity. Does that make any sense? Ya just gotta hear it. In summary, this is a wild and thoroughly fun album. And with all that's happening it boggles my mind to imagine that Carney is playing all the instruments himself, which apparently he is. Recommended to fans of artfully strange music. For more information you can visit the Ralph Carney web site at: http://www.akroncracker.com. Black Beauty Records are distributed through RUNT. You can visit their web site at: http://www.buyrunt.com. Contact via snail mail c/o Black Beauty; PO Box 18841; Oakland CA 94619-8841.